Two of the latest games by Innovative Concepts in Entertainment, are now in production. Tons of Ticktes, which is ICE’s first skill ticket title, first debuted at IAAPA 2018 last November and the backorder that has been generated since then “has been tremendous,” according to the company. Designed to be operator friendly, Tons of Tickets automatically reloads ticket bundles back onto the playfield removing the need for regular refilling, which was the main thrust of ICE’s design philosophy behind the game. ICE has also incorporated a small LED screen in the game with video animations aims which to engage audiences of all ages as well as providing an indicator of how many tickets they win during each game. 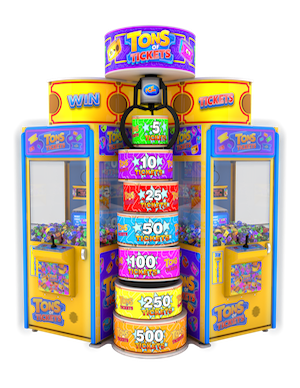 While the game is available as a single player unit, ICE is marketing this game in a two player format with an eye-catching ticket tower marquee display that sits between the two cabinets and improves the visual impact. Rolling off the production line at the same time as Tons of Tickets is the latest installment in ICE’s popular carnival series. Whack a Clown attempts to add a whole new dimension and dynamic to the whacker genre with the LED-lit clown heads. Players compete against each other trying to hit as many clowns as possible. Hitting the red clown on the playfield temporality freezes the action allowing other competitors to catch up adding a further skill element to the head to head competition. 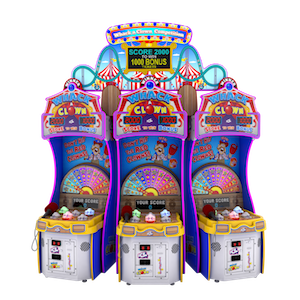 Whack a Clown allows for up to 4 games to be connected with its linked marquee which is designed to encourage competitive play. In both the single and multiplayer games, players can win a bonus by beating a pre-determined score. Both games are available now.